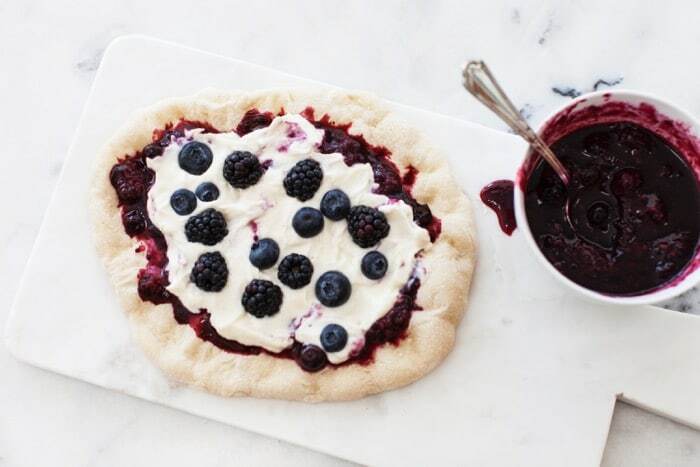 Goddess Dessert Berry Pizza with Whipped Ricotta, Mascarpone, Honey and Vanilla Blackberry Blueberry Sauce! 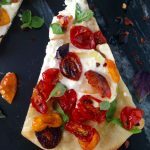 This to die for cheesecake like berry pizza is for you! Because whipped ricotta and berries you guys! 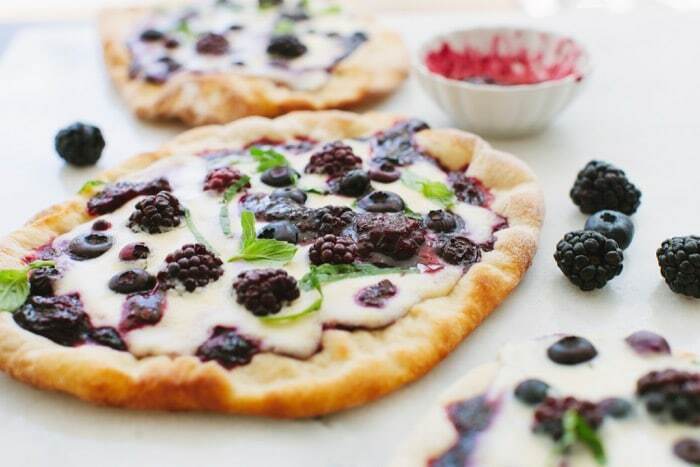 Have you ever had a berry pizza before ? If you did, then you know why I’m so excited about it, and if you didn’t then i’ll just tell you that it is like a lovely piece of cheesecake. Imagine that insanity! I literally had a pizza party yesterday, my kitchen was covered in flour and so was my hair. Totally worth it if you ask me. 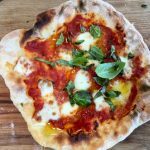 Especially after Google recognized my pizza making skills, remember that Burrata Pizza and rustic pizza dough ? That’s how it all started. Now, you can make this with blackberries or blueberries or even raspberries. I went for the blackberries and blueberries because they look the best at the market, plus I just love them on top of whipped ricotta. Basically I made a berry sauce on the stove top that I allowed to chill before using it as a pizza sauce in this really amazing dessert pizza. However, If you don’t feel like making the sauce, you can use a nice organic blackberry jelly instead. Then I top that with some whipped ricotta mascarpone vanilla mixture and a few berries, sprinkled with fresh basil from the garden and voila! I can’t even tell you.. I bet it would be amazing with a nice thick strawberry sauce on the bottom and fresh strawberries on top. Note to self! I know that a berry pizza might sound strange at first, especially if you’ve never had it before. But I assure you this is such delicacy, and so easy to make. I would suggest making small thin pizza pies, that way you don’t necessarily even have to cut them. And if you do, make sure to wait until they have cooled off for the cheese to set and use your kitchen sheers to cut it. So easy! Very important to make sure and cook the pizza dough for a few minutes before adding the sauce and the cheese on top. That is the secret to a crispy thin crust bottom. That and a hot pizza stone. You do have a pizza stone right ? ( If not, you can grab one from amazon here (<–affiliate). Goddess Berry Pizza with Whipped Ricotta, Mascarpone, Lemon and Honey Blackberry Blueberry Sauce! Prepare the berry sauce in advance. Add the blackberries, blueberries, lemon juice, vanilla extract and honey to a small sauce pan on low flame. Cover with a lid and cook together for a few minutes until the blueberries burst. Remove from flame and chill in the refrigerator until ready to use. Adjust sweetness to taste with more honey if desired. Make a batch of rustic Italian pizza dough and divide into 8 small pies. Add the mascarpone, ricotta, vanilla extract, lemon zest and 1 tablespoon of the honey to a small food processor and process together until smooth and fluffy. Keep cool until ready to eat. Preheat your oven with a pizza stone inside to the highest temperature it will go, for at least 45 minutes. Sprinkle some flour on your kitchen counter and form your pizza pies as suggested in the rustic pizza dough recipe. Using a fork gently poke each pizza before you transfer to the preheated oven and bake for 3 minutes. Working quickly and with care, open the oven and remove the pizza crust. Spread a thin layer of the blackberry blueberry sauce the bottom, leaving about 3/4 inch from the edges. 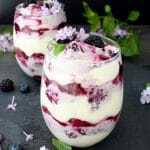 Spoon the whipped ricotta mascarpone mixture over the top in a thin layer and sprinkle with some of the berries. Transfer back to the oven carefully. Close the oven door and bake the berry pizza an additional 6 minutes or so until the crust is golden brown on the edges. At this point if you would like to get a little fire kiss on top of your ricotta cheese and berries, just transfer the pie under the broiler for about 25 seconds, making sure not to burn it. Repeat the process with the remaining of your pies and allow them to cool for a few minutes for the cheese to settle before slicing. Optional: Drizzle with some honey on top before serving and garnish with the fresh basil leaves. #1 This berry pizza is also really good cold, just like a cheesecake! #2 Feel free to substitute the berry sauce with a nice blackberry jam in a pinch. I love the sound of a dessert pizza, and it looks so decadent. I never would have thought to put berries on a pizza. I will be trying it though. What a completely different idea! I love the berries on this! Gonna have to try and make it at home I think!! You say pizza and you’ve won my heart. 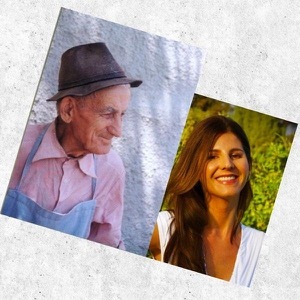 I’m Italian — there is no pizza I don’t simply love. A dessert pizza, how wonderful!! 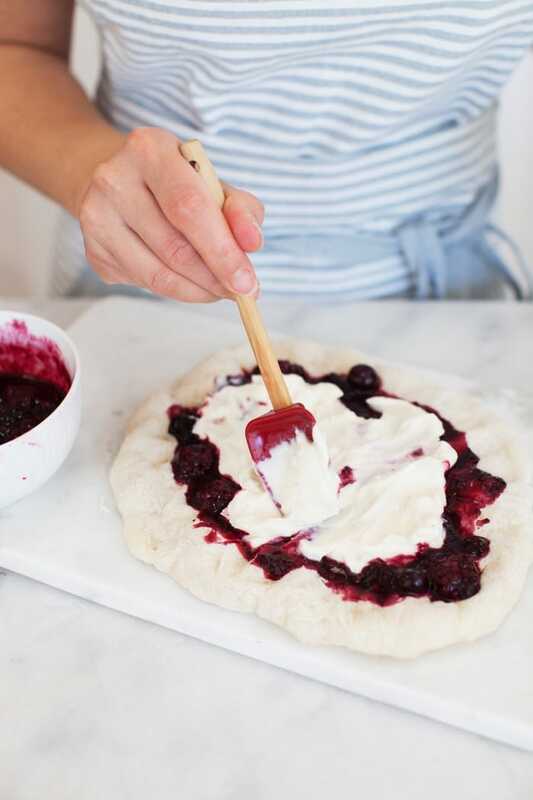 What great combination of berry, mascarpone n ricotta on a sweet pizza – Delicious. I have never had berry pizza but now I totally am going to try. This is beautiful! And I love that you use your rustic pizza dough to make it with. Thanks for the yummy recipe! thanks Heather, I use that rustic pizza dough for so many things. Make it, make it ! A dessert pizza? Never heard of that one before…love the idea! 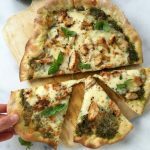 Fantastic combination of ingredients and flavors on this beauty Pizza has always been numero uno in my book and I think you just took it one notch higher! Just gorgeous. What kind of berries did you use for this? I love the color. thanks Hillary, I used blackberries but you can use your favorites, strawberries are next on my list. That is the perfect summer dessert pizza. The berries, ricotta, mascarpone – what a divine combination! Yes, summer hot days and I love this one chilled, so good! Florentina, have I ever mentioned that you are the pizza queen, that should be part of your blog name. This pizza is absolutely stunning, those blackberries and the mascarpone cheese are killing me! I love the strawberry jam suggestion, I must try it! You crack me up ! I need to add that in the title somehow : The Pizza Queen ” ha! I know this is a dessert pizza, but can I eat it for dinner? Looks so good! Yes we can Rachel, we are out of control with the pizza party ! I am pretty much in love with all of your pizzas! And super jealous of whoever got to eat them, they look amazing! 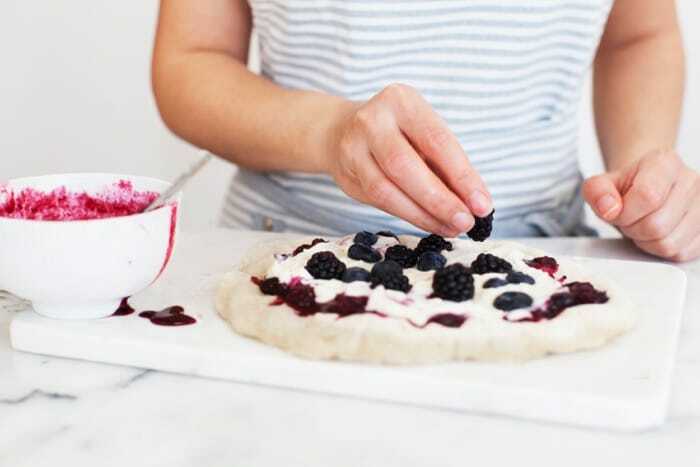 This dessert pizza looks so good, I love berries with ricotta! I have never had a berry pizza, but I am craving one now! 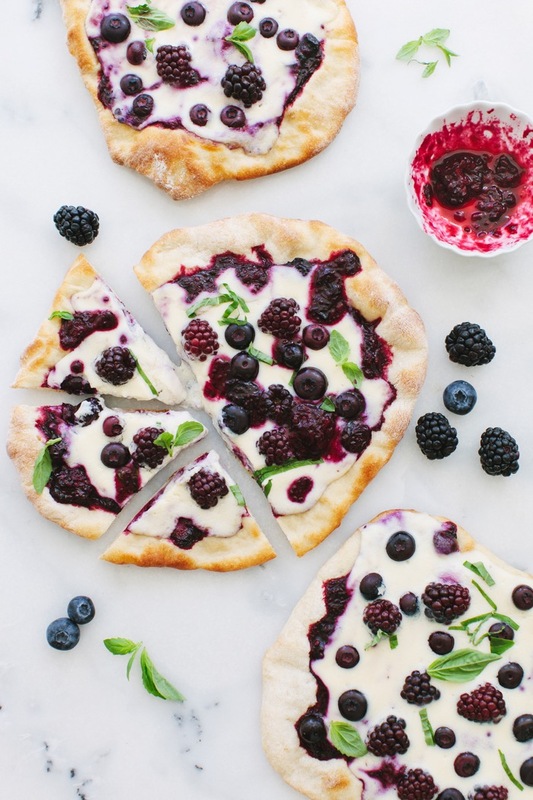 I love berries and mascarpone together, so I can only imagine how delish this pizza is. And that dough! Oh my goodness! Yum! YUM!!! This is gorgeous Florentina! This looks amazing, love the blackberries and the jam. Perfect dessert! This is a gorgeous pizza! Never had a berry one but I am sold on it, just by its look! Pinned to make it!